I have just added weekly e-mail announcements for ArtCal. Go here to see a sample and sign up. Are there any standards apart from taste and fame? This is pretty crass. Tyler already posted it (Don't miss his image), but I got the email too and wanted to share. We would like to bring to your attention a fraudulent situation or at the very least, a misrepresentation. The artist Jack Pierson has been making what he calls "word sculptures" for over 15 years now. The works are composed of found and retrieved signage from locations as diverse as Las Vegas casinos to defunct 42nd Street movies palaces. 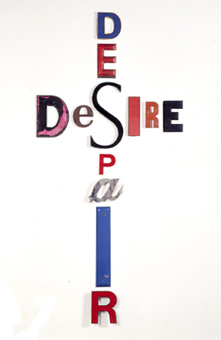 In a catalogue representing the collection of the Whitney Museum, they are described as "ready-made objects to express the pathos underlying the American Dream -- a pathos embodied in the mismatched letters of old movie marquees and commercial signs from which his work is created... His found letters are, in a sense, discarded dreams, their original purpose long forgotten." These works have been documented in numerous books chronicling contemporary art and are in the collections of the Whitney Museum, The Musée dArt Contemporain in France, The Walker Art Center in Minneapolis, The Baltimore Museum of Art, and the Museum of Contemporary Art in Los Angeles. They have also been published in box sets of postcards available at many museum bookshops. Around a year or so ago, imitations or forgeries of these works began to appear in Barneys clothing stores throughout the country saying such things as "fabulous, courageous, and outrageous." They are formally weak plagiarized versions of Jack Piersons work and we want you to know that they are not by Jack Pierson. Many people have assumed they are. They are, in fact, made by Simon Doonan, the chief window dresser at Barneys. Jack Pierson has asked that he remove them but he has refused. We regret this lack of integrity on the part of Simon Doonan and Barneys. 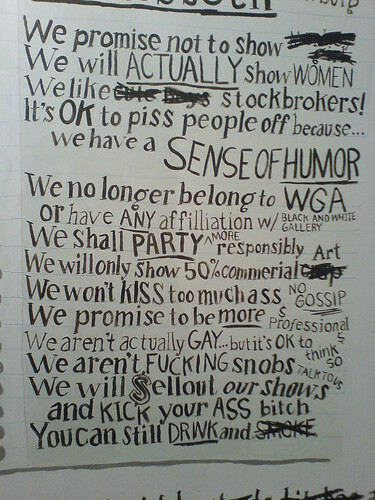 They obviously have no respect for artists or the art world. 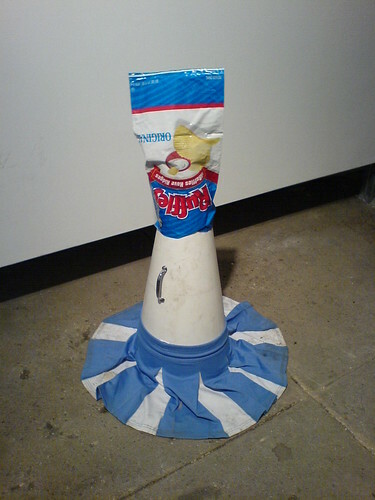 Jack Pierson's show at Cheim and Read opens at the end of this month. For future reference, the store is "Barneys" not "Barney's." In a time when clowns are tortured and circuses banned, a renegade troupe enacts the story of a girl who longs for their outlawed life. 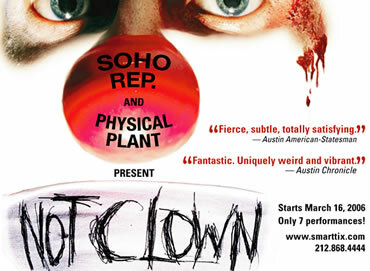 I don't know if there are tickets left, but there are two more performances (tonight and Saturday) of "Not Clown" at Soho Rep. It will be the best $15 you have spent on theater lately. I have to say, this isn't the play for people expecting a Broadway show. It's more in the spirit of the good East Village / Lower East Side work I saw in the late 80s and early 90s. It's disturbing and strange. I will admit that, at times, I found it annoying and repellent, and wondered what I was doing there. By the end, I realized the dramatic reasons for those sections, and felt it was one of the best things I've seen in the theater in a long time. Those of you who know us probably aren't surprised to read that we like art that annoys, disturbs, and then pulls it all off briliiantly. The company presenting it, Physical Plant is based in Austin, Texas. I don't have time to write more right now, but wanted to get this posted so maybe some more people can go see it. Like starlings on a trash-strewn field the hipsters alight together, peck intently for a time, and at some indiscernible signal take wing again at once. If they are the American avant-garde it is true, I think, in only this aspect -- the unending churn of their tastes, this adult faddishness in the adolescent style. You have one more week to see it. Go on the hour and watch the 50-minute film. It's more than worth the time. It's a disturbing Lord of the Flies meets Outward Bound experience. 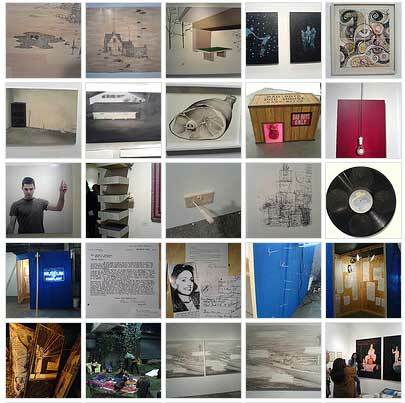 The show already closed, but the image may give you some sense of the magical environment. The image above is a detail for the part that points to Schroeder Romero. In Wisdom and Charisma, a group of middle-aged men, who used to play Dungeons and Dragons twenty years ago, meet after work for a session of the role-playing game. Seated around a corporate boardroom table, the Dungeon Master, dressed in red, leads the others in debating pathways through astral planes and portals of pandemonium while stationary, control room-like, cameras allow for the reactions and silent exchanges between the players to be fully scrutinized. Their clothes and body language indicate their executive occupation and social standing, a strong contrast to their adolescent pastime. Photos from other shows, plus some images from Williamsburg, will be up on Flickr soon. As always, use the photos (newer) link on the upper left to get to my latest photos. The best thing from Sunday in Williamsburg was the group show at LMAK Projects, curated by Franklin Evans. It's a top pick on ArtCal, and up for one more week. Froth happens: Thoughts on the art fairs and "the market"
I was surprised by the number of people who had really negative things to say about the Scope fair. I found it to be a great deal of fun, and filled with a lot of interesting art. I particularly enjoyed a number of the German galleries. Check out the photos I took at Scope. I suspect some people found the wackier stuff, including the installations in the middle, not "serious" enough and therefore wrote off the whole fair as unserious and lacking in good work. The way Todd Gibson described it makes sense to me and is closer to my view of it. No one can be impervious to the sales hype the fair brings out, and since so much of what is shown at this fair pushes a formalist aesthetic, it is hard to know the difference between those things that are legitimately good and what merely looks good. Everything looks like you should buy it. Lately I feel I have encountered a lot of art that feels middlebrow, but is made with great skill. While I find some aspects of the current market off-putting, I'm also happy to see a huge number of artists making money from their art. Under those conditions, froth happens. Yes, a lot of people that make crappy art will be deemed marketable, but I prefer that outcome to one where almost no one sells work unless its already certified as blue chip. We live in a country where there is very little public funding for art. Even if there were, given the Neanderthals in charge, we would probably end up with a lot of flag paintings, and I don't mean in the style of Jasper Johns. 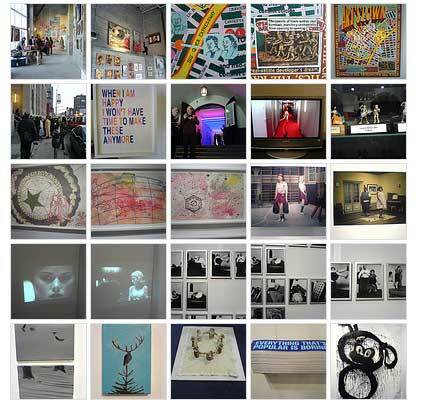 I have finished uploading and labeling 192 photos from last week's art fairs to my Flickr feed. Go here to see them. EM: Who do you think are some of the most influential artists today? PJ: I think the most important work being made today is in the medium of new media, which isn't clear to many yet, but it is why artists like Cory Arcangel (who I suspect will be the next Jeff Koons), MTAA, Marisa Olson, and PaperRad are mentioned so frequently on Art Fag City. We saw Sophie Scholl at Film Forum yesterday. It's a very powerful film about using one's conscience when everyone else is trying to just "get by" in a totalitarian state. I highly recommend seeing it. It runs through the end of the month. The image above was taken in Munich, at the site of their distribution of anti-Nazi leaflets at the Ludwig University. We visited it in September 2002. 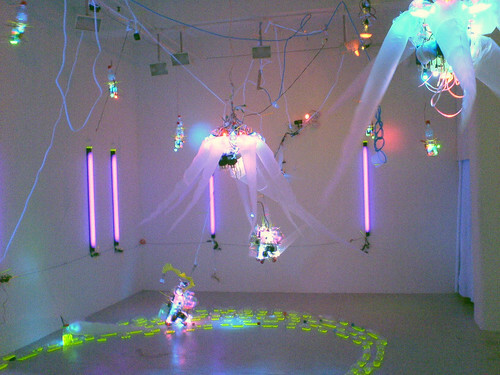 On a normal weekend in Williamsburg, with the L subway line running on schedule, several hundred people might visit artMovingProjects if it has a popular exhibit. 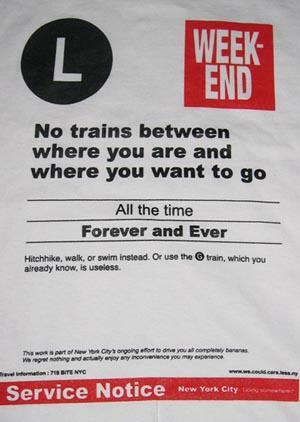 But when the L train is shut down, owner Aron Namenwirth said he's lucky if 10 local artists show up. But such is life along the L line. For the last three years, the Metropolitan Transportation Authority has been modernizing the line so that it can someday accommodate a higher capacity. In order to do the work, the MTA often shuts down the line on the weekends. Since January 1 of this year, the L line has been closed on four weekends out of nine. It's a situation that hits Williamsburg art galleries especially hard: Most are only open Friday through Sunday. A co-owner of Schroeder Romero gallery, which recently packed up and moved to Chelsea, said her gallery was losing about $10,000 a year because of weekend disruptions on the L line when it was located in Williamsburg. 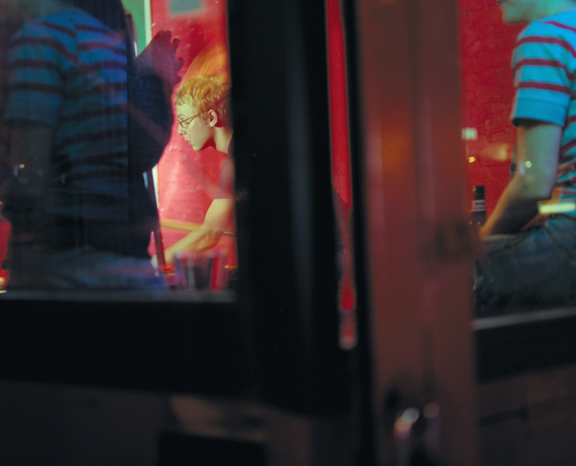 The neighborhood is known for its upstart art scene, but the problem also affects the bars, restaurants, and shops that usually do their best business on weekend nights. The MTA originally promised to be finished by June 2005. The current estimate from them is June 2006. The funniest thing I heard about the art fairs was said to me last night at the closing party at White Columns. I was telling an artist that James and I attended every fair except DiVA, even Fountain. His response was, "Diva? Was that the LA one?" 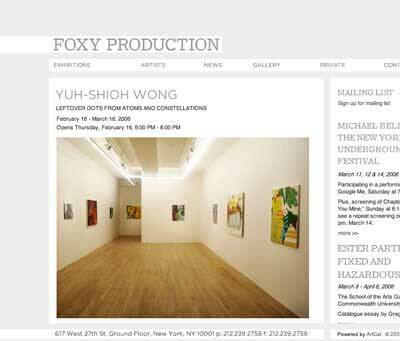 are running the same software, with minor changes to HTML, CSS, and a bit of Flash in the case of Foxy Production. 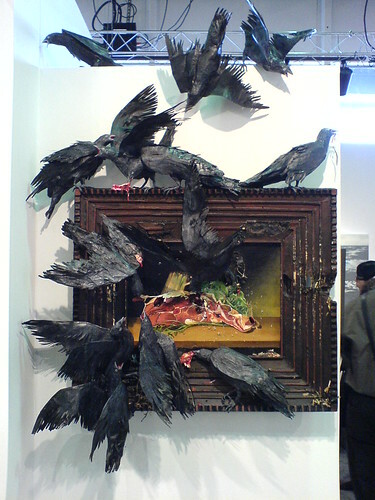 I'm too tired to post more at the moment, but based on all that I've seen so far, the Scope art fair is the one to see. Tonight was the "new" opening after the problems of yesterday, and it was quite the scene. There was good energy, a lot of great art, and performances / installations / wandering artists galore. We attended the press preview of the Armory Show today. It was called a press preview, but we often had trouble looking at work because of roaming packs of coifed collector women. I'm sure all the big name collectors were there, and I spotted the Rubells and Horts right away. I had heard from at least one gallery that they had had some difficulties with getting a reasonable number of passes for their collectors, but I guess plenty of them didn't have too much trouble. We only made it through most of one pier, so we have to go back. Commercial. It's the new non-profit. I have no idea to what it referred. Perhaps the presence of non-profit art spaces selling work at the fair? We tried to go to the press preview for Scope, but that didn't work out. Fountain had some fun stuff from several galleries, and a good mixed crowd, ranging from grungy art collective types to prosperous collectors. I just put up a bunch of photos of things I liked, and could get decent photos of, on Flickr. I know everyone is distracted by the Whitney Biennial and the art fairs, but it has now been three years since the disastrous attack on Iraq. James and I will be attending this event tomorrow. I've been to other concerts by Ensemple Pi. They are amazing. An event of contemporary concert music, poetry readings, and visual images, with showcases of several independent publishers including Seven Stories Press, The New Press, Akashic Books, Verso Books, and Autonomedia. Participant artists include composers Frederic Rzewski, Elias Tanenbaum, composer/performers Kristin Norderval and Philip Wharton in collaboration with Ensemble π, led by pianist Idith Meshulam. Poetry readings by Charles Bernstein, Carolee Schneemann and Peter Lamborn Wilson. Visual images selected from the archives of the art critic David Levi Strauss. 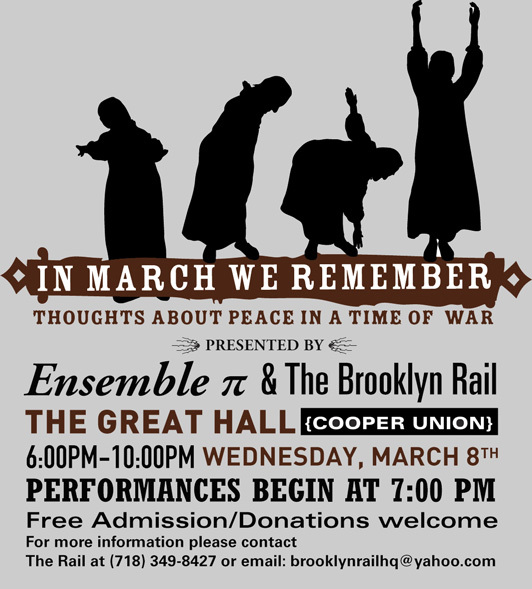 The event is made possible by the support of the Lower Manhattan Cultural Council, the Edward T. Cone Foundation, and Cooper Union. Sorry to be commercial here, but I wanted to announce that the sites I host on ArtCat (see clients list) now have RSS feeds. As the galleries and artists add news items, or works (artists) or exhibitions (galleries), you'll see new info in the feed. What's RSS you ask? This is a good link that explains it. I use RSS feeds and www.bloglines.com to keep up with 98 different web sites -- mostly blogs. The Lance Project consists of images of young men who resemble in some small way my friend Lance. The images constitute a composite portrait of him. Though I knew Lance for eight years, he died without my ever having his photograph. The rest of it is here, and the artist has a web site too. I found this moving and beautiful project via John Morris, who runs the Digging Pitt gallery in Pittsburgh. 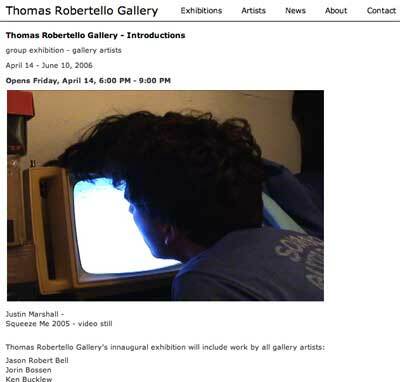 I first heard of him and the gallery via the artist (and Pittsburgh native ) Emily Noelle Lambert. This is the funniest photo I've seen so far from the Whitney Biennial. I forgot to mention one thing that surprised me about the press remarks at the Whitney Biennial press preview. The only person who spoke to the press other than Adam Weinberg and the two curators was Jennifer P. Goodale, Vice President, Contributions, Altria Corporate Services, Inc. I realize Altria is an important funder of the arts, and I really appreciate how much money (however earned) is given by them to so many cultural organizations. However, it struck an odd note for me. I also see that the press release has a quote from Ms. Goodale as the third paragraph. Too much for one day! James and I need to be cloned or have teleporting skills for days like this. Tonight, Plus Ultra and Schroeder Romero open in their new spaces on 27th Street. See ArtCal for more info. Panelists in this discussion will reflect on the legacy of Downtown art. Performance, punk, feminism, and queer activism are among the current concerns of the young artists and organizers taking part. Examining their own work, speakers will reconsider the relevance of terms like "Downtown" and "alternative." With JD Samson, Le Tigre, musician and artist; Dean Daderko, curator; Ulrike Müller, LTTR, artist; Jeremy Wade, Chez Bushwick, dancer; Nate Lowman, artist. Moderated by Matt Wolf; Carlo McCormick, respondent. James and I attended the press preview yesterday. I expect to write more, and put up some more photos, but I wanted to post some random initial impressions. Also, I can't use my catalog for reference yet since the cover fell off when I opened it and the pages haven't all been cut (oops those are fold-outs). My first impression is that there are a lot more artists with whom I was unfamiliar, unlike the previous one. I'm pleased to see that, because I don't want the Biennial to show a lot of work that regular New York-based gallery-goers have already seen. 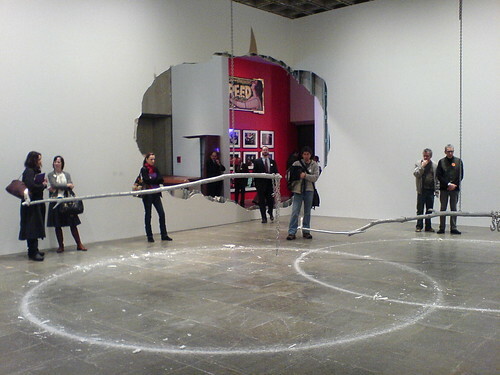 A number of works (such as those of Jutta Koether) were created in the spaces, with the curators indicating that the artists' responses to the Breuer building were an important part of this Biennial. I was struck by the mention of the curators visiting Berlin to see works by young American artists. I worry very much about New York's ability to remain a cultural capital when it's so hard for artists to afford to live here. This week-old article from Crain's New York on the subject gives some statistics from a study by the Freelancers Union. There is a great deal of political work in the show, which is fine by me, as well has heavily conceptual work. Joao Ribas has an interview on Artinfo with the curators in which they discuss the number of "anonymous" or "fictional" artists/collectives in the show. I would also say the spirit of Beuys is apparent in the show with works by Urs Fischer, JP Munro, and others. One more observation: I found it odd that a number of works dealing with African-American issues and politics were all put together -- including works by Dawolu Jabari Anderson, Robert A. Pruitt, and Otabenga Jones & Associates. I didn't see a specific mention of a conscious choice to put these near (or next to) each other in any wall texts, but I can think of few other obvious groupings of work dealing with "identity politics" in the show. 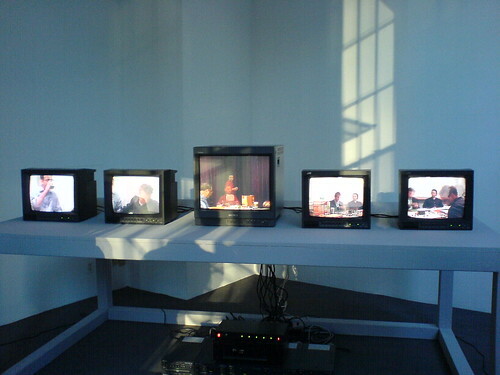 This page is an archive of entries in the Culture category from March 2006.